The phrase "hungry for adventure" takes on a whole new meaning. A reader story. 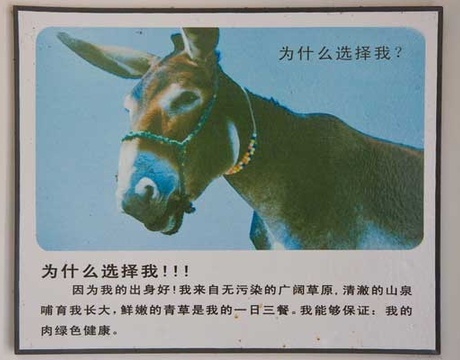 BEIJING, China – The Chinese have a saying: The best meat in heaven is dragon, the best meat on earth is donkey. Since my husband and I have no immediate plans to visit heaven, we decided to try donkey when given the chance. Beijing was the last stop on a multi-week trip that began in St. Petersburg, Russia. As we traveled through Central Asia, we sampled sturgeon roe, honey cake, quark fritters, cherry cordial, chicken heart, fried bees, milk tea, and horse meat soup. Wherever we went, we sought not the most extreme tastes, but the most typical ones. Each bite offered an opportunity to feel as if we actually lived in the places we were passing through. So, in the few days we had before returning to the United States, we searched for and nibbled Beijingers' favorite foods, including roasted sweet potatoes, thin eggy crepes known as jian bing, and steamed bread called mantou. We sipped unsweetened yogurt through a straw and drank cup after cup of tea. Particularly good morsels — like coconut balls and dumplings with chicken and corn — we decimated, and not just because we sometimes fumbled with the chopsticks. For one final taste of the city, our guide took us through Rundeli Shichang, an energetic market full of fruits, vegetables, spices, and, curiously, vacuums, to a restaurant she knew along a side street. Inside, donkeys beamed at us from the walls, many wearing beaded necklaces, each flashing a grin white enough and shiny enough to make supermodels cry with envy. Surrounding the posters were slogans exploding with exclamation points. A poster exclaiming (!) the benefits of a donkey lunch. Our guide ordered lurou huoshao, then translated the signs. People eat donkey because it's yummy, she said. But it's also thought to combat depression, calm anxiety, increase virility, and make people stronger, happier, and healthier all around — in other words, it's a cure-all for everything except cancer and war. We took our lunch outside. We preferred the risk of losing a foot to a bicyclist in the street to staring at pictures of Eeyore while chomping on his cousin. Ribbons of lean reddish meat and the occasional green chile peeked out from grilled flatbread. One bite in, and my husband and I turned to each other in surprise. Warm and robust, the cured meat had a salty, slightly smoky chew. 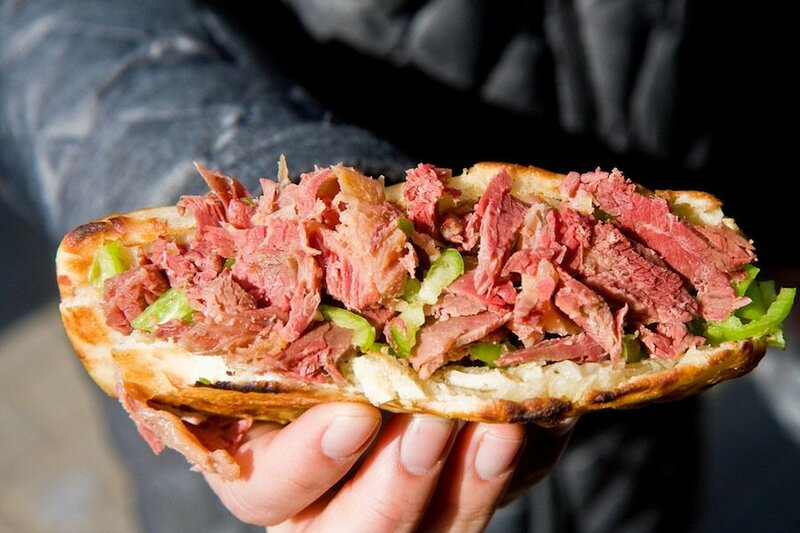 We might have been eating the pastrami sandwich we always order from a deli near our New York City apartment. All that was missing was some mustard. Yet we were standing in a hutong, munching on fare utterly foreign that tasted of home. It was delicious. Jess is a New York-based writer who is really excited about an upcoming trip to Eastern Europe. She travels for the sensory overload.